This article looks at the issue of the arts and climate change, from the perspective of art and science. On the one hand, scientific knowledge about climate change is complete. However, actual change is slow. In the context of the art world, it is clear we are living in a post modern world. Consequently, art is understood not solely for its inherent characteristics (the modernist view) but for the way art works interconnect with culture (the postmodern view). So what we have in terms of art and science is the knowledge required and the cultural theory in place, but slow change and an art world largely disconnected from the issues of climate change. Why might that be? This article is based on a presentation given to the Aotearoa Digital Artists 2014 symposium and I thank them for providing the context to bring these thoughts together. Before I begin, following my work with tangata whenua (in particular Te Matahiapo) I will introduce myself by saying I am a hybrid Polynesian who comes from the sea. I live in Te Ika a Maui (the North Island of New Zealand). Te Ika a Maui. Image: ESA. 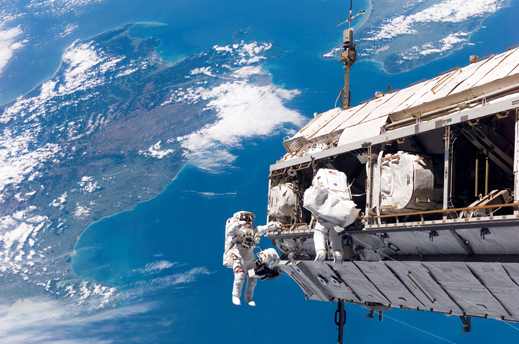 I was born in Te Wai Pounamu (the South Island). I have strong affiliations to Norfolk Island (pink circle) and Pitcairn Island (green circle). 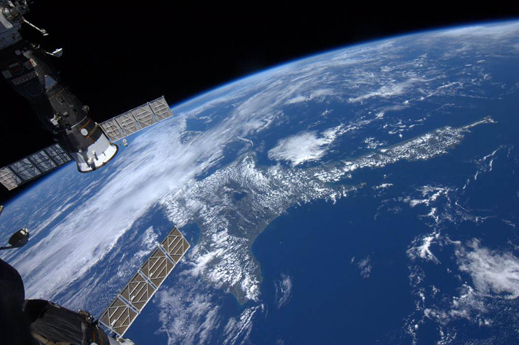 To island separate by vast swathes of Te Nui Moana a Kiwa (also called the Pacific Ocean). I say I come from the sea because it is the sea that connects these places. 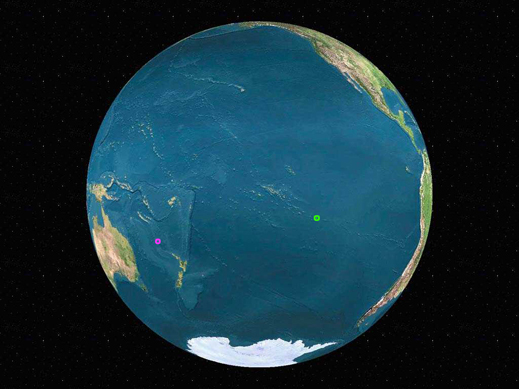 Norfolk Island (pink circle) and Pitcairn Island (green circle). 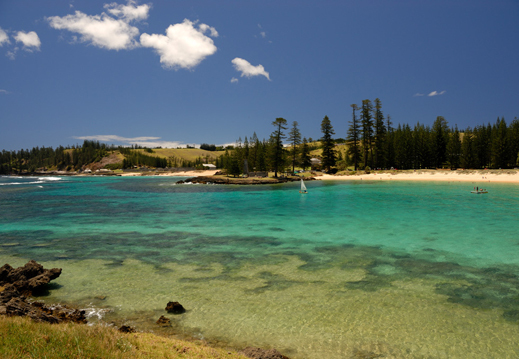 My mother was born on Norfolk Island, and she met my father there in 1946 by swimming into him in Emily Bay – another reason I say I come from the sea. Due to this heritage and the Mutiny on HMAV Bounty saga, I can whakapapa to Tahiti. This is important in some situations, particularly to tangata whenua. 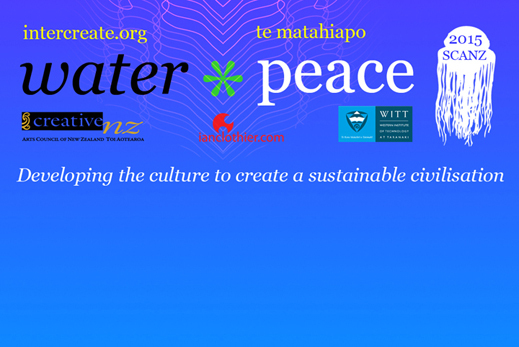 I am also heavily involved in intercreate.org and particularly in the project SCANZ2015:water*peace. At Intercreate we often refer to the need to develop the culture of a sustainable civilisation. SCANZ water and peace graphic. And along with collaborators, I am an artist working in the electronic arts. 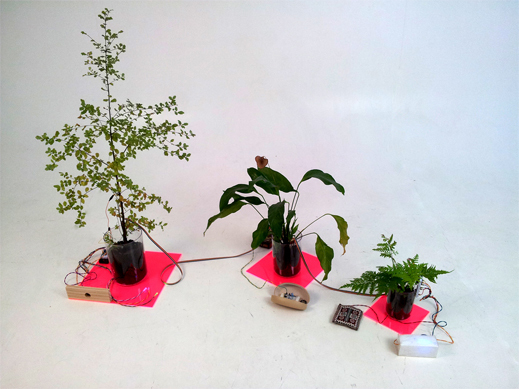 Following is an image of the test set up for World Tree Ensemble: tiny_garden exhibited at grey ) ( area in Croatia. The work is by me and Andrew Hornblow. “tiny_garden” test set up. Source: http://ianclothier.com/tiny_garden. Firstly, I would like to acknowledge the many people with whom I have collaborated, the many thinkers, writers and artists who have influenced my own thinking. Secondly, one of the many subjects under discussion today, is the idea of interdisciplinarity. While there are many projects and activities that are interdisciplinary, there are fewer articles that discuss ideas directly from an interdisciplinary perspective, so I thought this would be a good situation to see what both science and art have to contribute. Consequently, this article will initially look at surfing and the characteristics of culture, then DNA and Plate Tectonics, followed by the culture around knowledge. Following from this will be a look at the creative and cultural sector in the context of work by Marina Abramovic and Ulay. Donna Haraway’s critique of the naming of the current geological era as the Anthropocene is then referred to, prior to a consideration of where responsibilities lie in this era of climate change. In 1976, Stephen Wayne Hull presented a sociological view of surfing culture which outlined the reason why surf culture could be distinguished as a distinct sub culture, in what we would call today a hybrid culture. The basis for this was that surfing had it’s own rules governing behaviour, specific terms and custom language, dress codes and preferences for certain types of food and creativity. I mention this here as language, collegiality, rules governing behaviour, dress and consuming food and genres of creativity apply to other sub cultures within society. There is a contrast between the development of scientific knowledge in regard to understanding the structure of DNA, and the acceptance of Tectonic Plate Theory. While the long timeline of DNA manipulation can be traced to 9000 years ago in Mesoamerica with the selective breeding of maize, in modern genetics there was a crucial period between 1944 and 1953 when an accumulative sequence of research events resulted in Watson, Crick, Wilkins and Franklin identifying the double helix structure. The period prior to 1944 was referred to as “intellectual chaos” by Watson, as much research was being done in the dark: researchers had data but simply couldn’t understand how it all fitted together. It was only when Watson and Crick decided to try and build a model, that the structure was defined. For many this story of the development of knowledge around DNA, carries an assumption that this applies across science: separate teams working in specialist laboratories incrementally resolve issues leading to a break through that is acknowledged in the field and subsequently society in a rapid progression. We shall soon see that this concept does not hold in all situations. To both diverge and dovetail with the comments about culture and surfing, in the preface to Recombinant DNA which is cited above, James D Watson referred specifically to “a scrapbook like compilation of the largely sociopolitical events that occurred there” when discussing a 1975 conference on the guidelines for the use of recombinant DNA techniques, highlighting the non-data based associations around knowledge. Indeed academic disciplines do use specific terms and language, have expected behaviours (going to conferences and reading journals, for example), collegiality, fairly rigid guidelines for presenting language and over coffee, it is likely that a preference for consuming certain types of food and creativity can be found (I mean here coffee, Jazz and Classical music). While academia does not have dress codes aside from predominantly covering up, these other traces of sub cultural profile indicate that science like other aspects of human activity, has a culture. To return to the theme of the structural operation of scientific methodology, the theory of Continental Drift was first proposed by meteorologist Alfred Wegener in 1912, whose book The Origin of Continents and Oceans was published in 1915. This idea was not orthodox at the time, and as a result even though it was the right idea, the concept was completely dismissed. Wegener lacked an explanation for the forces required and had to battle the holders of orthodox ideology. Then in 1929, Arthur Holmes suggested thermal convection for geological plates. Once again, this was dismissed by the majority of scientists and both were ignored until the 1960s. Anyone who has presented unorthodox ideas at symposia will understand the full force of antagonism that comes from challenging paradigms. In 1962, Harry Hess published The History of Ocean Basins, outlining what became known as ‘sea floor spreading.’ In part this was a consequence of the use of radar in WWII and the development of marine geology afterwards. Frederick Vine, Drummond Matthews and Lawrence Morley then confirmed spreading using electromagnetic field data around ocean ridges. John Tuzo-Wilson in 1965 proposed transform faults. The processes for drifting continents were then in place, and for much of the 1960’s an either/or situation was cited in textbooks. Through the 1970’s and 80’s a gradual transition took place, with new adherents finding positions of authority and transforming the taught ideology. Consequently, there was a period of 50 years when the right ideas were ignored. Then there was a slow and generational transition toward acceptance. So why didn’t plate tectonics follow the DNA model of development? One answer lies in the Watson’s reference to the conference on guidelines around recombination. Around a knowledge base, a community is formed. This community will have shared information sources such as reading the same journals and attending the same conferences. Friendships develop, based on shared views of the data. If the members of the community hold all the positions of authority in regard to papers and conference submissions, then this becomes the orthodox viewpoint. The greatest single factor in changing the orthodox viewpoint is a combination of accumulated knowledge and generational change as the adherents of old ideologies move on. This longer process appears to more adequately describe the development and acceptance of Continental Drift. Consequently knowledge has points of connection to culture, in terms of the world view of the individual and the culture of the community around the knowledge. This contention may seem novel in some situations, however it is borne out in for example, the development and acceptance of Chaos Theory between the 1970s and the end of the millennium. This contention is also supported by a review of knowledge and nation (whose origin is in place, though this can be transported): Indian knowledge is indeed different from Chinese knowledge. What I draw from this is that the culture of science simply was not ready for plate tectonics for 50 years. This can be seen in academia throughout the 20th century where the development of new ideas required older generations to move on, rather than the correct idea changing the beliefs of those holding the standing orthodox opinions. The aim here is not to bring doubt on scientific method but to elucidate the precise structure of that endeavour and the associated connections that arise in an analysis based in integrated systems. I will now park this speculation on science and culture, and venture over to the creative sector, and look at what is going on there. By the time they arrived for ANZART in Christchurch in 1981, Marina Abramovic and Ulay were renowned for their arrow piece The Other: Rest energy. To experience Witnessing, the audience filed silently into the Great Hall of the Arts Centre, and formed a line around the perimeter of the room. In the middle of the space (but not the centre) Abramovich stood on a plinth and pointed to Ulay who stood on the floor. This work had a duration of three hours, and was typical of their endurance performances which placed physical tension and strain on the artists. To fast forward to 2010, during Abramovic’s The artist is present Ulay appeared as one of the line of people who could spend some time and space with the now solo female artist. She sat at a desk in the middle of the space, and the audience lined up around the perimeter, to consider, photograph and contemplate the piece. I am not here providing a critique of either art work, but rather drawing attention to the fact that the set up is almost exactly the same. The artist as central, the audience as viewers who are separated by space, behaviour and hierarchy. The centrality of the artist and a dichotomy between artist and viewer in a way that upholds hierarchies is typically Modernist in approach. This is despite the art world shifting in ideological terms over this same time period, from Modernism to Postmodernism and on to the multicultural, hybrid, remixed, multiplicitous, media saturated, internet based, user generated type ideologies of the current era. The song remains the same in the art world. The culture of modernism has not broken down as the primary adherents have not yet moved on in generational terms, and the practices of a lifetime persist. Once again the aim of this reflection is not to negatively critique the creative sector or the cited creative projects, but to elucidate the structures at play in and around the creative sector. As it happens, I quite like Abramovic’s work. Screen grab of the Vimeo page for the video discussed. 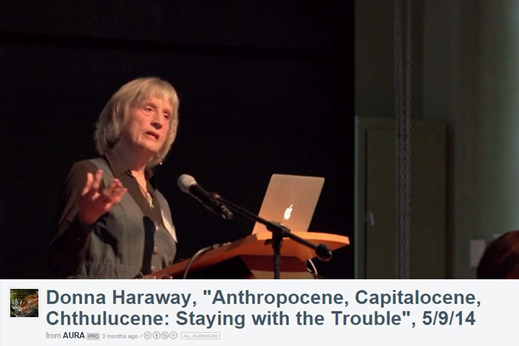 In this video (particularly the first 3 minutes 25 seconds) Haraway is speaking on issues around the naming of the current geological era and when it should be considered to have commenced, where the discussion it seems likely will result in this geological period being known as the anthropocene. This is ironic, as she points out while critiquing the timing of the start of this period (called by some the Capitalocene). In putting forward a concept of Chthulucene, she provides a summary of contemporary intellectual and research based activity, one that is opposed to some of the values seen in the creative sector above, though which will be familiar to the community around the electronic arts. Clearly there is for Haraway a dissonance between environmental discourses and creative approaches endorsed in the upper echelons of the art world such as the Museum of Modern Art (an institution for which I have some affection). To now draw all of this together, it is pertinent to ask: is the culture around art and creativity ready for sustainability? There are many instances of artist driven initiatives on the environment (Caroline Robinson, Janine Randerson and Natalie Jeremijenko for example) and some instances of galleries and art organisations (the Govett-Brewster, Te Tuhi, and TheBigIdea.co.nz) but as a whole art institutions are supported and funded completely outside of a discourse on the environment. The contention I am making is that this not good enough, particularly for publicly funded institutions and organisations. Changing culture possibly rates as the hardest task we can set ourselves, and the best way to do that is to start today. Replicating the binary power structures of modernity will not assist us with the change that is sought. We need a culture that is inclusive. We need to unite environmentalism and driving around in cars, in ways that reconstruct our relationship to the environment and builds a culture of sustainability. As electronic artists and educators yes there is a role to play here. Just as it is important that humanity engages with the environment, it is likewise important that governments and organisations do likewise, along with the organs of government and projects funded by central, regional and local bodies. In some sense the lack of resolution of climate change problems is driving us to a position whereby soon there will be no choice: we will have to, for the sake of our own survival.